Not long ago, in a galaxy not so far away from wherever Comcast placed truTV in your cable lineup, the era of the dominant men’s college basketball team was over. Last year, no team had more than a 15 percent chance of winning the NCAA men’s tournament, according to FiveThirtyEight’s pre-tournament forecast (Louisville was the best bet). In 2011, the nominal favorite was Duke, with a 22 percent chance. In 2012, it was Kentucky, at 27 percent, and in 2013, Louisville led with a 23 percent chance. While two of those favorites (Kentucky in 2012 and Louisville in 2013) happened to win, the lack of dominant teams left the door wide open for lower seeds to make a deep run, as No. 7 seed Connecticut did in winning last year’s national championship. This year is much different — an echo from a bygone era of short-shorts and star players who actually played through their senior seasons. The Kentucky Wildcats are undefeated; they could become the first men’s team to finish the season undefeated since the 1976 Indiana Hoosiers. Kentucky has a 41 percent chance of winning it all, according to our forecast — about double what we’ve seen from front-runners in recent years. There’s not a lot to critique in the Wildcats’ résumé. While the SEC is not a terrific basketball conference, Kentucky played a reasonable non-conference schedule and won 13 games against other NCAA tournament teams. The Wildcats rank first in all but one of the computer power ratings that the FiveThirtyEight model uses and a close second in the other. They were last year’s national runner-up and the preseason No. 1. They have all the talent in the world, including three possible NBA lottery picks. But a 41 percent chance isn’t all that high. It remains more likely than not that Kentucky will stumble at some point along the way and won’t win the national championship. What could go wrong? Some of it is the unforgiving mathematics of a 68-team tournament. The Wildcats will be a favorite in every game they play for the rest of the year, but they’ll be playing some capable basketball teams. The odds of running into a streak shooter, or having a game in which they miss some free throws down the stretch, are fairly high. Let’s get more specific. Below, I’ve tallied Kentucky’s chances of winning each round of the tournament, according to our model (the rightmost column). I’ve also listed the Wildcats’ chances of winning each round conditional on them having survived the previous round. So in the conditional column, we’re fast-forwarding the tournament and assuming that Kentucky wins at each stage. For instance, Kentucky has about an 85 percent chance of winning its Elite Eight game and advancing to the Final Four, provided that it’s made it that far. Kentucky is at least a 73 percent favorite in every round. It’s not in an especially tough region, and the team will be able to stay close to home, needing to travel no more than 282 miles from campus (the distance from Lexington, Kentucky, to Cleveland, Ohio, home of the Midwest regional) to win the tournament. But even with the odds stacked in Kentucky’s favor, winning six consecutive games won’t be easy. And there are some other excellent teams in this tournament. Suppose that because of some clerical error, Kentucky’s spot in the tournament instead went to Northern Kentucky, which went 13-17 in something called the Atlantic Sun Conference. In that case, the five teams with the next-best chances — Arizona, Duke, Villanova, Virginia and Wisconsin — would collectively have a 68 percent chance of winning the title. That’s better than the cumulative 54 percent chance that the top five teams had last year. In other words, this would be a top-heavy tournament even without Kentucky. While there’s not a clear No. 2 after the Wildcats, the teams ranked from second through sixth or seventh nationally (in some order) are a strong group, a bit stronger than we’ve seen in the most recent men’s tournaments. So let’s explore the field region by region. 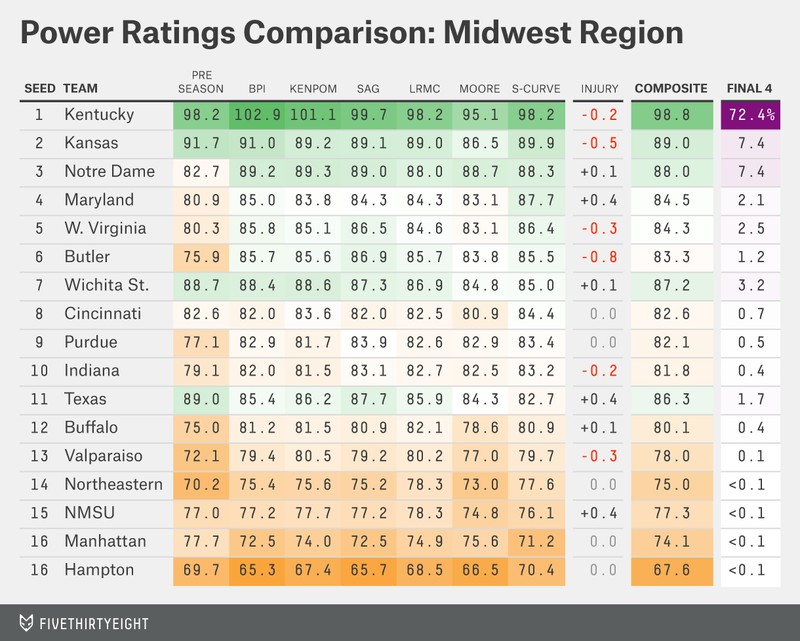 For each one, I’ve listed each team’s rating according to the seven ratings systems that the FiveThirtyEight model averages to generate its forecasts. The rankings from each system are normalized so as to make them directly comparable. Five of the seven systems are computer rankings, and they tend to produce highly similar results. It will usually be more interesting to compare the computer rankings with the two human-generated polls: where a team ranked in the preseason (teams that overachieve during the regular season have a history of reverting to the mean in the tournament) and where it placed on the selection committee’s 68-team S-curve. Teams with higher S-curve ratings than computer ratings are potentially overseeded; teams with higher computer ratings than S-curve ratings are possibly underseeded. While the Wildcats may not quite have even odds of winning the national championship, they are more likely than not (a 72 percent chance) to reach the Final Four. Kentucky has a favorable draw, but some of that is by the committee’s design. The best No. 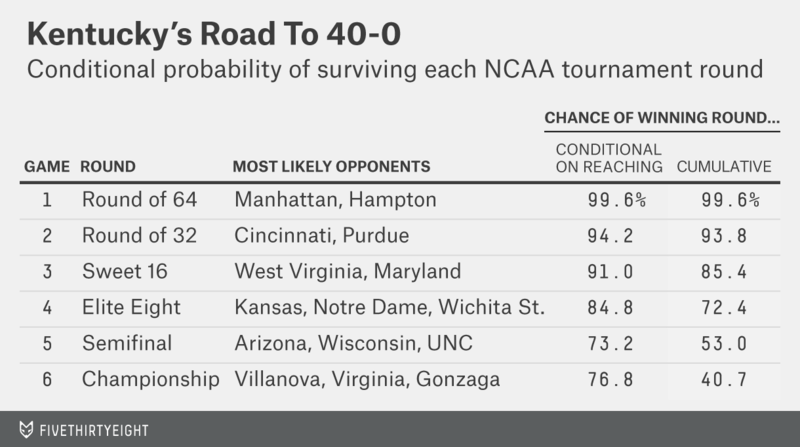 1 seed — Kentucky this year — is theoretically supposed to be paired with the worst No. 2, and the committee made good on that by placing Kansas in Kentucky’s region. While Kansas has an entirely respectable record for a No. 2 seed, it ranks behind the other No. 2 seeds (Virginia, Arizona and Gonzaga) by the metrics we track. Kentucky also faces a relatively easy Sweet 16 game. Maryland and West Virginia, the No. 4 and 5 seeds in the Midwest, are both slightly overseeded, according to our model. Dark horses in the Midwest include Wichita State and Texas, which are badly underseeded as No. 7 and No. 11, respectively. Even there, however, Kentucky catches something of a break. It can’t face either the Shockers or the Longhorns until the Elite Eight. In fact, the top two seeds in the West — Wisconsin and Arizona — rank as the second and third best teams nationally, according to our composite ratings. The No. 2 seed, Arizona, actually rates slightly higher than Wisconsin; Arizona is also the only team ahead of Kentucky in any of the seven systems we track (Arizona rates slightly ahead of Kentucky in Sonny Moore’s power ratings.). Still, these are marginal differences. 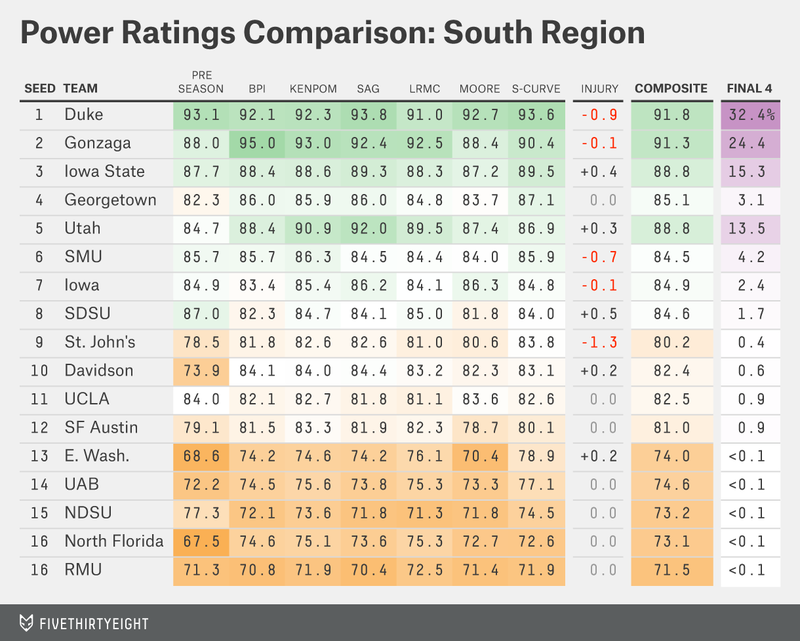 (Arizona’s composite power rating is 94.7 while Wisconsin’s is 94.1, which means that Arizona would be favored by less than a point on a neutral court.) So why does the model give Arizona a considerably better chance — 46 percent against Wisconsin’s 33 percent — of reaching the Final Four? Some of it has to do with each team’s Sweet 16 matchup. Wisconsin’s prospective opponent (No. 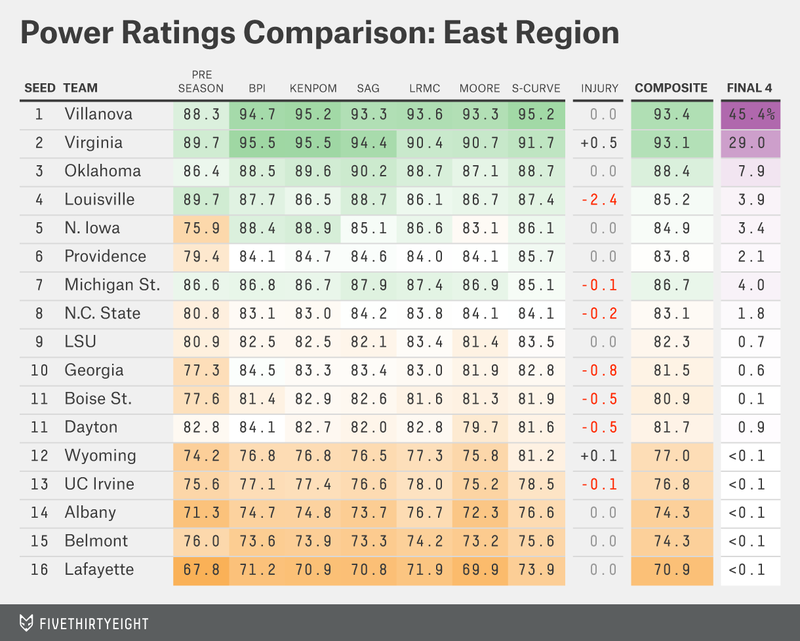 4 seed North Carolina) rates as being stronger than Arizona’s (No. 3 seed Baylor). But the geography also works in Arizona’s favor; the regional final will be played in Los Angeles. There’s not much depth in the West after the top four seeds. But one potential exception is the No. 10 seed, Ohio State, which is as strong as a typical No. 5 seed by the computer ratings even though Aaron Craft finally graduated. Villanova is the second-most-likely team to win the national championship. That’s a bit misleading; there’s a huge gap between Kentucky (41 percent) and Villanova (11 percent) and a tiny one between Villanova and the next-most-likely champions (Wisconsin and Arizona, at 10 percent each). Still, Villanova will benefit from being on the opposite side of the bracket from Kentucky, Wisconsin and Arizona. Villanova does have a tough No. 2 seed in the East region in the form of Virginia, but there aren’t a lot of easy outs among the No. 2 seeds this year. Virginia wasn’t done any favors by the committee, by contrast. No. 7 Michigan State, which knocked the Hoos out of the tournament last year, looms as their Round of 32 matchup. Like last year, MSU seems to have been underseeded, even before considering Tom Izzo’s history of postseason overachievement. Full disclosure: I’m from East Lansing. The East region also features an unusual circumstance: The University of Dayton will get to play on its home court in its “play-in” game against the other No. 11 seed, Boise State. This is part of why our model considers Dayton a 73 percent favorite in that game despite having only a slightly stronger power rating than the Broncos. Last up is the South, the most wide-open region this year. Even as a member in good standing of the Christian Laettner Hate Club — we’re automatically enrolled in East Lansing — I don’t mean to disparage No. 1 seed Duke. One can question whether Duke deserved a No. 1 ahead of Arizona and Virginia, but that’s because the No. 2 seeds are really good this year. Duke would be a No. 1 without much question in most recent tournaments. But the Blue Devils do potentially face a tough No. 2 of their own in Gonzaga. And they’ll have to win their Sweet 16 game to get there, where they may face No. 5 Utah, among the more underseeded teams in the tournament and a favorite against No. 4 Georgetown. The South also runs fairly deep: No. 8 San Diego State and No. 10 Davidson are tough outs, for instance. What about the much-maligned No. 11 seed, UCLA? Actually, our forecasts suggest that the committee did just fine with that choice: UCLA’s computer ratings are right in line with its seed. Either way, though, it probably won’t matter. Overall, this isn’t the best year for underdogs — the favorites are really something for a change.